Healthy relationships are one of the keys to fostering positive school culture, so says Roland Barth (read his 1990 work Improving Schools From Within) and Michael Fullan (Leading in a Culture of Change). I do my part to bring teachers together by incorporating team-building activities into my faculty meetings, workshops, and curriculum writing sessions. 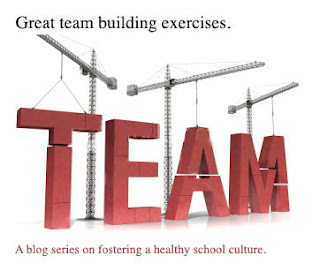 This blog series describes those activities I have found most engaging. Snowball Fight- This is one of the easiest exercises to prepare and facilitate. It can serve to generate conversation about any topic so I use it frequently to open up meetings I think will be a challenge because of the nature of what will be discussed. The only material you need is a piece of paper for each participant. Start by having everyone respond to a prompt that you give them. Have them write their answer down on the piece of paper in front of them. Then, have them crumple up the pieces of paper in little balls. After a three second countdown, tell everyone to throw their paper balls at each other. Finally, conduct a debrief by going around the table having each person read the responses to the prompts on the paper received. I often interject by providing additional information to the responses. Conversations can take up to an hour. One of my curriculum teams spent over an hour talking about the following prompt,"what is curriculum?" This flexible, easy-to-use icebreaker can be used in any setting you choose.